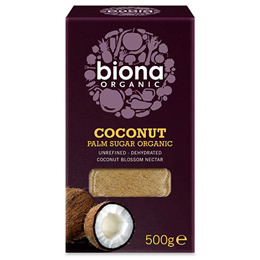 Enjoy the rich butterscotch, caramel flavours of this coconut blossom sugar. Gula Java (coconut sugar) is unrefined and made from the nectar of coconut palm blossoms. Use as an alternative sweetener in drinks, baking and desserts. Use as an alternative sweetener in drinks, baking and desserts. May contain traces of nuts, sesame, soya and gluten. Below are reviews of Biona Organic Coconut Palm Sugar - 500g by bodykind customers. If you have tried this product we'd love to hear what you think so please leave a review.